I just had a new power supply and mobo put in my system. For some reason the system will not recognize my GPU. It keep coming up in GPU-Z and Device Manager as Unknown Device, and my games will not run. After looking around the pc I saw that my friend put in a 350w power supply. I had a 630w previously. Is this the reason I can't get the PC to recognize it? Reinstall the driver for your video card. You might also try reseating the card. The power supply has nothing to do with Windows recognizing devices. (10-13-2013, 08:48 PM)mwhals Wrote: Reinstall the driver for your video card. You might also try reseating the card. The power supply has nothing to do with Windows recognizing devices. Every time I try to remove the old driver I hit a stone wall as it won't let me uninstall thru the Device Manager. Sorry but I'm not very PC savvy. I've already reseated the card twice while trying to figure this out myself. 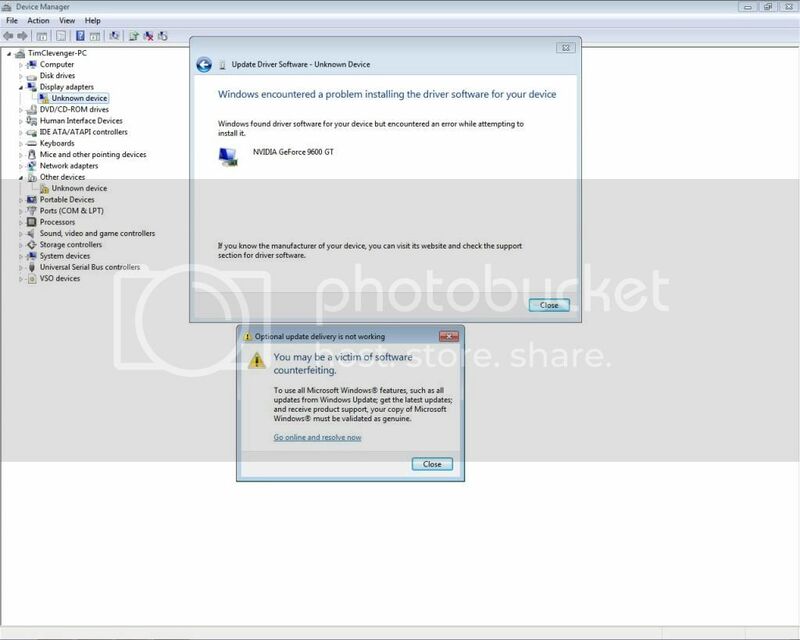 Try downloading a new driver from the manufacturer's web site. I think your driver file could be corrupted. Step by step what I am trying to do. went to remove previous update version but it's not there. All that is there are two files. 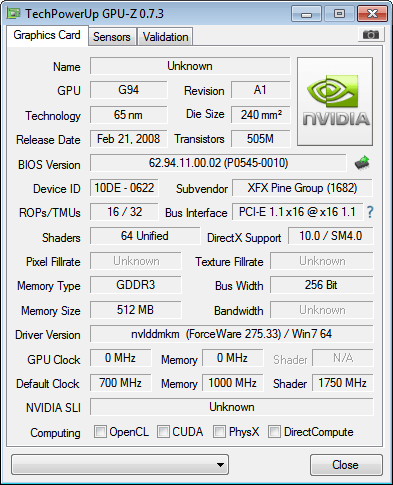 "Nvidia PhysX System Software 9.10.0514" .... "Nvidia Update 1.3.5"
right clicked Unkonwn Device under Display adapters. Ran Drive Sweeper and selected everything Nvidia Except Chipset and cleaned it out twice. went to downloads and clicked on my driver update 327.33 ran it. I'm getting really wired out about this and I've been trying Anything I could find on the interwebs to download the driver and I may have messed it all up in the process. Can't even download Nvidias geforce experience. It's getting to the point where I want to drop Darik's Boot and Nuke and start all over from scratch. Will this at least get me to a point where I can start over again with a fresh start with Nvidia as a whole. So you mean wipe out everything and then install Windows again? This could fix your problem, although it is more extreme. "I just had a new power supply and mobo put in my system." There's your problem. I usually recommend wiping out and re-installing the OS after changing a motherboard, due to frequent issues with the previous motherboard/chipset drivers and the new motherboard. Sometimes, it's just easier to wipe out and re-install the OS. (10-16-2013, 02:14 PM)MathieuB Wrote: "I just had a new power supply and mobo put in my system." I missed the new MOBO! Definitely wipe it out and reinstall Windows.